We are delighted to be returning to Clacton for our fourth annual event and are greatly indebted to the Rotary Club for their generous sponsorship and to the Clacton Masons for free use of their Temple. This sponsorship allows us to provide FREE PSA blood tests to detect Prostate Cancer at an early, curable stage. Prostate Cancer is the commonest major cancer in UK men and second commonest cause of cancer deaths with over 47,000 registrations and over 11,000 deaths each year. This is one of the highest death rates in the world and these statistics are very similar to those for breast cancer yet we have no national screening programme. Although nearly all current major national and international urological guidelines recommend PSA-based screening programmes, NHS provision remains patchy and only 10% of UK men actively seek screening. Our objective is to fill this gap by raising awareness and providing PSA testing for appropriately counselled men. We recommend screening should start in a man’s forties, especially for men with a family history of prostate cancer or breast cancer on his mother’s side and especially for black African or Caribbean men who have a 1 in 4 lifetime risk of Prostate Cancer. Being in a screening programme can halve the risk of dying from Prostate Cancer! At our Rotary event last year 13 out of 98 men tested had an abnormal PSA. 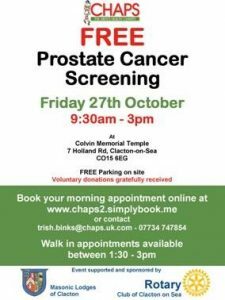 Colin, aged 63, was diagnosed with Prostate Cancer and writes “I had no symptoms and hence cannot praise enough the CHAPS event. I feel very fortunate that it was caught at an early stage”. After successful curative surgery Colin now feels “Absolutely 100%!”. (name and contact details can be supplied). We believe it is essential that the positive information on Prostate Cancer Screening is broadcast and known as widely as possible and thank the Rotary Club and Masons for helping us achieve this in Clacton.